Our herbal bath and facial steam blend is handcrafted with aromatic herbs and a touch of aromatic essential oils formulated to help relieve congestion, seasonal allergies and combat the symptoms of the common cold. 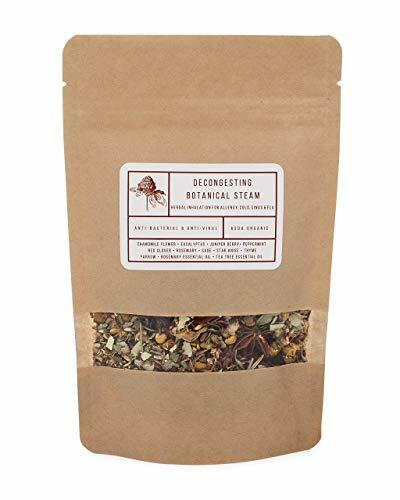 This herbal blend is specially formulated with organic and fair trade Chamomile Flowers, Eualyptus Leaf, Juniper Berries, Peppermint Leaf, Red Clover Blossom, Rosemary, Sage, Star Anise, Thyme, Yarrow and essential oils of Rosemary, Tea Tree and Thieves Blend. The aromatic herbs used in this decongesting and antiseptic blend work together to help open up congested sinuses and lung passageways, allowing you to breathe easier and loosen mucus. This blend can also be used as a bath tea and herbal compress, one reusable cotton muslin bag is included in each order. Decongesting herbal facial steams and bath teas are a holistic approach to treating colds, coughs, seasonal allergies and congestion. Each order contains 4 decongesting botanical steams or 3 bath teas, 1 muslin bag, detailed instructions for setting up a facial steam and detailed instructions for setting up a bath tea.